Keeping your office organized leads to better productivity, time management and helps lower the frustration of misplaced prints within the workplace. A Brookside Blueprint Plan Rack Stand will help you maintain the organization of your plans and blueprints, making them easily accessible. 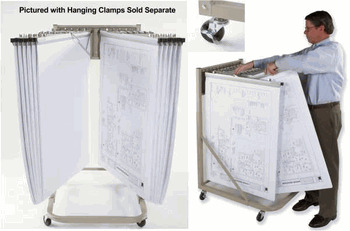 Employees will have the ability to move the stand from one work area to the next via its 3” ball bearing wheels with a rear wheel locking mechanism, making it easily movable from one area of the office to the next for the use of keeping prints readily available and preventing clutter and disorganization. Everyone will appreciate its ease of use. The rack has a capacity of 1200 sheets and is telescopically adjustable in height and depth for prints up to 60” in length. It comes with twelve chrome plated pivoting blueprint hangers, which swing wide for access making the rack easily accessible and easy to use. The Brookside Blueprint Plan Rack is constructed of heavy gauge steel and has a powder coat finish that is chip resistant. It also comes with a limited lifetime warranty, ensuring that your equipment investment is covered. This rack is compatible with the Safco 5026 and Mayline 9429H blueprint stands and racks. This compatibility makes changing from one brand to the next, practical. Hanging clamps from 18” to 42” in size, which are sold separately, gives you flexibility in storing different sized prints on the same rack. The Brookside Blueprint Plan Rack ensures portability, compatibility, ease of use and expandability for use in your architectural firm, art studio, or engineering firm making it an integral tool to maintain organization of prints and blueprints within the workflow or your organization. A valuable investment, it will aid your staff in their daily functions and is a necessary item for replacement of old equipment or for business expansion. With a limited lifetime warranty and free shipping, you will have the peace of mind of having made a wise business decision to further the smooth operation of your company.